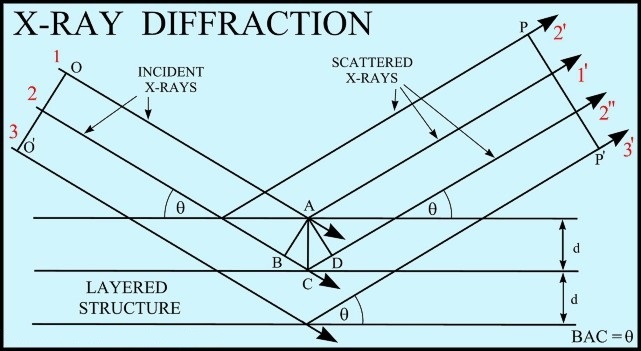 Bragg diffraction (also referred to as the Bragg formulation of X-ray diffraction) was first proposed by William Lawrence Bragg and his father William Henry Bragg in 1913 in response to their discovery that crystalline solids produced surprising patterns of reflected X-rays (in contrast to that of, say, a liquid). They found that these crystals, at certain specific wavelengths and incident angles, produced intense peaks of reflected radiation. Sir William Lawrence Bragg explained this result by modeling the crystal as a set of discrete parallel planes separated by a constant parameter d. It was proposed that the incident X-ray radiation would produce a Bragg peak if their reflections off the various planes interfered constructively. The interference is constructive when the phase shift is a multiple of 2π; this condition can be expressed by Bragg’s law (see Bragg condition section below) and was first presented by Sir William Lawrence Bragg on 11 November 1912 to the Cambridge Philosophical Society. Although simple, Bragg’s law confirmed the existence of real particles at the atomic scale, as well as providing a powerful new tool for studying crystals in the form of X-ray and neutron diffraction. 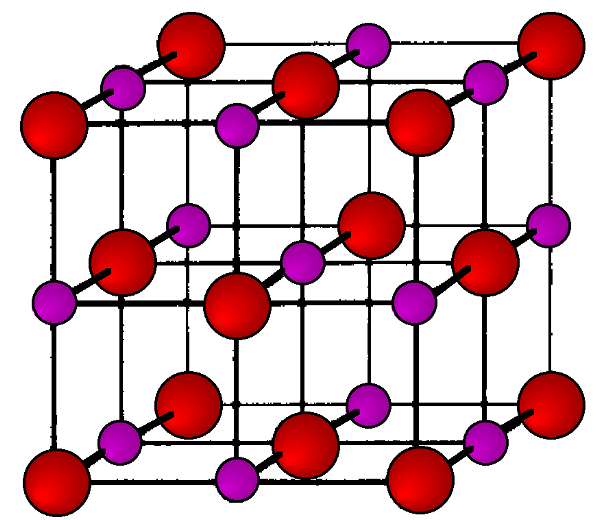 Sir Lawrence Bragg presumed that the atoms of a crystal such as Sodium Chloride or Lithium Fluoride were arranged in a cubic and regular three-dimensional pattern as depicted in the image below. We can calculate the distance between two adjacent crystal planes in the following way : the mass of a molecule of LiF is M/N Kg, where M is the molecular weight (25.939 x 10-3 kg per mole) and N is Avogadro’s number (6.02 x 1023 molecules per mole). The number of molecules per unit volume is Mρ/N molecules per cubic meter, where ρ is the density (2.64 x 103 kg m-3). The first condition for Bragg “reflection” is that the angle of incidence θ equals the angle of reflection – this is as for optical reflection and infers that any detector of the reflected rays must move through an angle 2θ, the 2:1 spectrometer relationship. 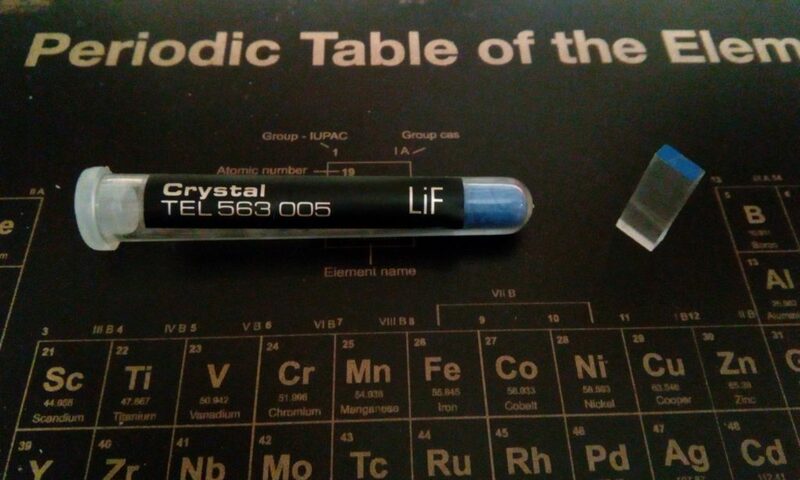 With our diffractometer we measure diffraction reflections from a LiF single crystal, as depicted in the image below. To perform the experiment mount the LiF crystal in the crystal post ensuring that the major face is in the reflecting position. Mount the primary beam collimator on the shielding dome and mount on the carriage arm the 3 mm slit collimator and the 1 mm slit collimator and the geiger detector behind the 1 mm slit. Using a ratemeter track the carriage arm round from its minimum setting (about 12° 2θ) to maximum setting (about 120° 2θ), record the count per seconds (CPS) at 1° intervals. Where the count rate appears to peak, plot intervals of only 10′ arc using the thumb-wheel, at each peak, measure and record the maximum count rate and the angle 2θ as precisely as possible. The image below shows the setup. 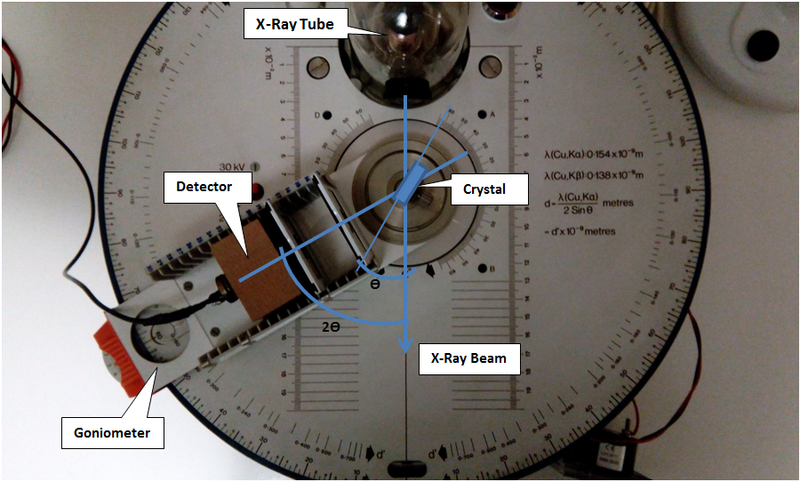 The chart below shows the results obtained with the LiF crystal and the x-ray tube operated at 30 KV and 50 μA. It is possible to recognize four main peaks : the first two corresponds to the first Bragg reflection for the Kα and Kβ emissions of copper, while the second set of peaks corresponds to the second reflection. Around 20° and 30° there is the scattering of the continuum emission of the x-ray tube at greater energies. Changing the high voltage : 20 KV instead of 30 KV, we can obtain a slight different spectrum, shown in the chart below. It can be seen that the intensities of the peaks is reduced (the continuous part also) but not the position of the peaks. 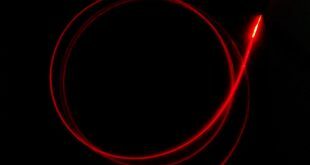 In order to have a nearly monochromatic x-ray emission it is possible to use a filter that absorbs selectively the x-ray wavelengths shorter or longer than the main Kα emission wavelength. This can be accomplished with a Nickel filter which absorbs mainly shorter wavelengths and has a minimum in the absorption correspondent to the main Kα emission. The result spectrum is shown in the chart below where it can be seen that the Kβ peak has been greatly reduced. 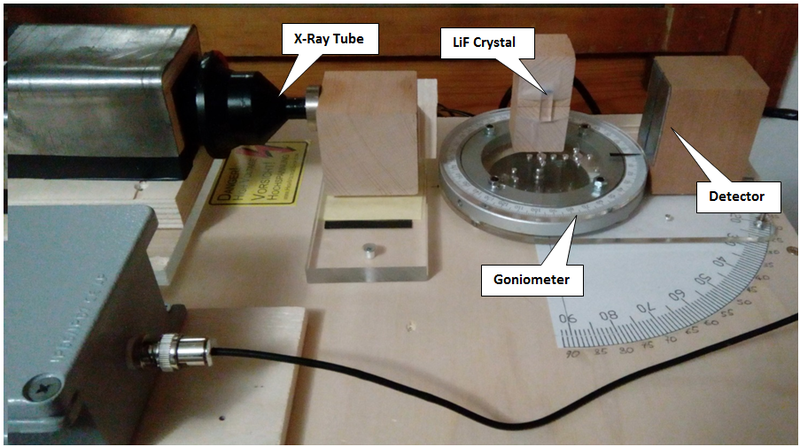 We did the same with our DIY diffractometer base on a Ge X-Ray tube : the image below shows the setup of the equipment. Below there is the spectrum. We have obtained lesser intensities but despite the simplistic and maybe naive equipment the peaks are clearly visible. The results are in good agreement with the literature data.